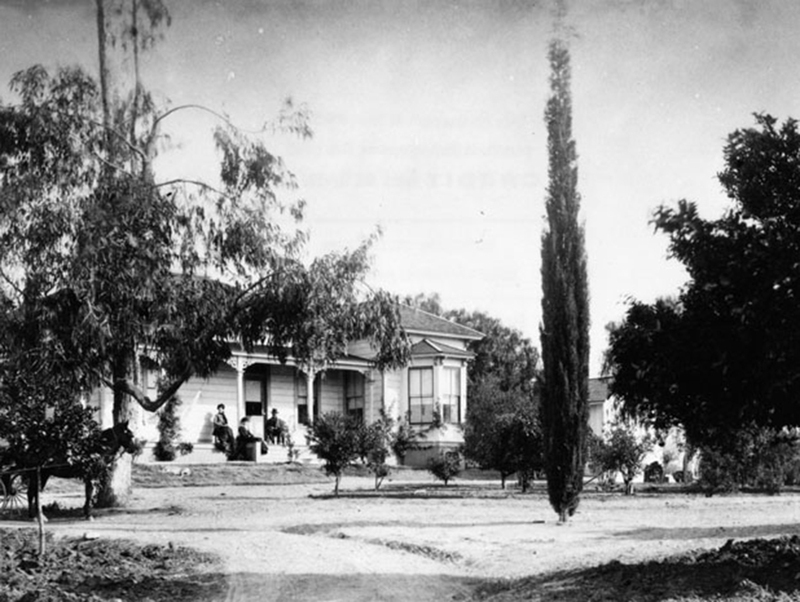 "Exterior view of P.M. Green's residence near Columbia and Orange Grove, in Pasadena. Mr. Green was an early day, 1st banker, and one of the 27 founders of the Indiana Colony. " 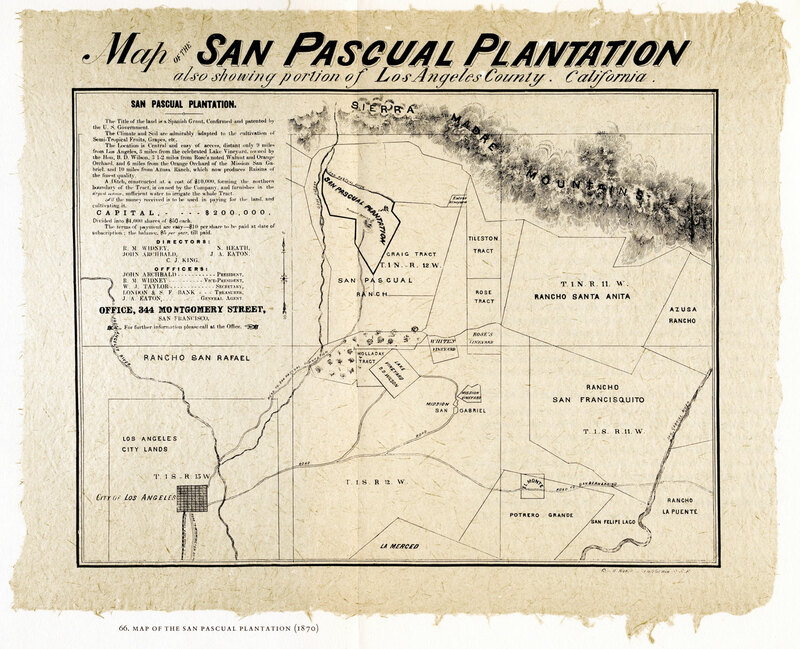 Few areas in the Southland underwent so many title permutations as the lands described as the “San Pascual Plantation.” The rare map seen below was included in a letter from surveyor J.W. North, and founder of Riverside, to his wife in Los Angeles, delivered on July 22, 1870. The surveyed acreage (14,430 acres in all) has a storied history with more twists and turns than Mulholland drive. The land began as Rancho El Rincon de San Pascual when Mexican governor Jose Figueroa granted it to Juan Marine after the secularization of the Mission San Gabriel in 1834. Later, around 1843, Manuel Garfias claimed the land, and his request was granted by governor Manuel Micheltorena. After statehood Garfias became a bit over-extended from building his $5,000 showplace adobe on the edge of the Arroyo Seco, so he began selling off pieces of the estate. Surprisingly, the Indiana Colony flourished, and by 1875, their area of residence had become Pasadena—a name derived from the Chippewa word for “crown of the valley” that had a nice ring to it. Pasadena continued to be a citrus-growing community, even garnering the top prize for their oranges at the Los Angeles Citrus Fair in 1881. By 1890 they had added roses to the mix. As Professor Charles F. Holder said at a meeting of the Pasadena Hunt Club that year, “In New York, people are buried in snow, here our flowers are blooming and our oranges are about to bear. Let’s hold a festival to tell the world about our paradise.” The result was of course, the Rose Parade. Other parts of the original rancho were also sold to John and Fred Woodbury who created present day Altadena, famous for Christmas Tree Lane, the Mount Lowe Railway, Zorthian Ranch, the Balian mansion with its insane holiday lights, Tim Dundon’s compost heap, and my birthplace, St. Luke’s hospital. 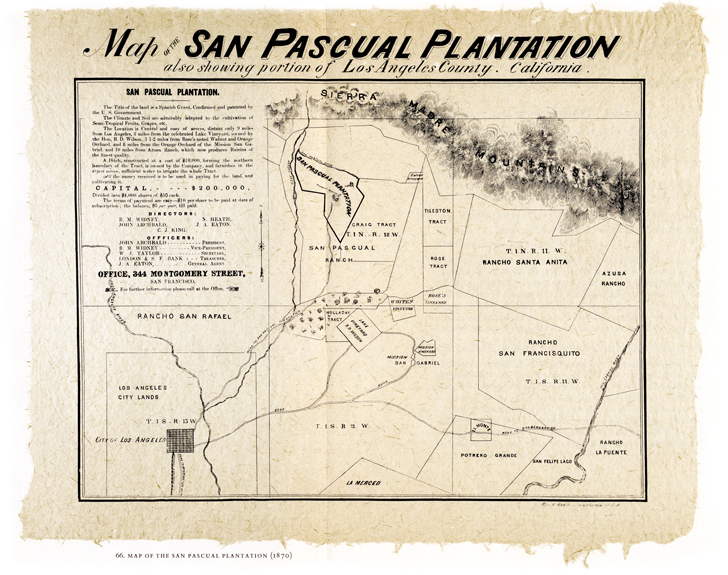 The last piece of the Rancho San Pascual Plantation—just three-and-a-half square miles—managed to break away from Pasadena and incorporate in 1888 as South Pasadena. Connected to the big city of Los Angeles by streetcars, it became one of Southern California’s earliest suburbs. South Pas was originally called Vaytsuung’xuilhoor by the Tongva, who had numerous settlements along the arroyo there. One of the main attractions of South Pasadena was the Cawston’s Ostrich Farm. It had its own streetcar line and drew folks out to the San Gabriel Valley from all over the Southland.